First, let me say thank you to those that came out to the Happy Hour on Tuesday! It was good to see you face-to-face. There was some discussion about lane width and LOS in San Rafael, my pie-in-the-sky ideas about cycle tracks, and some consideration of how to focus development into downtown Santa Rosa. Apologies if you missed the sign, but I’m glad at least some of you recognized my smiling face. The (in)famous John Parnell was supposed to show, but, alas, had a family to attend to. Next time, expect it at the Mayflower at 4th & D; no need to brave the punishing 29. Pedestrian Observations: Written by mathematician Alon Levy, Pedestrian Observations is a heady, technical blog on transit and urban design that always produces solid work. The commentariat is intelligent, well-informed, and just as interesting to read as Alon himself. Human Transit: Written by transit consultant Jarrett Walker, Human Transit is his professional blog, dealing with the basic, underlying issues that form how we understand transit design and policy. Planetizen: Not really a blog, Planetizen is a blog and a news links page, with articles on urban and transportation affairs from across the world. Lastly, I’m back in DC. I have a few irons in the fire that may or may not pan out for the blog, such as a new contributor and some small-time syndication beyond Patch. If you want to contribute a tip, idea, or article, send me an email at thegreatermarin [at] gmail.com. It was encouraging to see Marin doing its thing, and I can’t wait to go back. Until then, you’ll always find me here. The most baffling thing about Marin is how unbikeable its thoroughfares are. Sir Francis Drake, Second & Third Streets, Miller Avenue, Redwood Boulevard – they’re all sorely lacking in bicycle amenities. We shunt our cyclists onto side roads or put down sharrows but it’s honestly not enough. The video above highlights the progress made in New York City, and they’ve done absolutely spectacular things in the past five years. But why should they have all the fun? Marin County invented the mountain bike and Safe Routes to School. Our cafes are hangouts for spandex-clad biker gangs. We have the culture, we have the towns, but we just need the will. We’ve done the flashy projects – CalPark Tunnel, the Novato north-south path – but they’re out of the way. Instead, I want to bike down Miracle Mile and Third Street. I want to lock my bike to something other than a tree in San Rafael. I want to feel safe biking in Tam Valley and on Delong Avenue. Marin is still one of the best places to live, but New York is showing us up. In 2012, let’s show New York what we’re made of. Some effective branding at the Hub, telling the world of GGT’s competence, class, and lack of a laminator. For those of you that don’t know, I’m a Marinite that lives in Washington, DC, so commuting by GGT isn’t exactly normal for me. (If you’re wondering why I blog on Marin issues while living across the country, my FAQ has a bit more detail.) But, I’m home in Marin for the next two weeks for Christmas, giving me a golden opportunity to try the GGT. I’ve written about maximizing our bus system before, but there’s nothing quite like on-the-ground experience. My few days have been eye-opening. Poor signage. The transit pylons are ugly, not weatherproof, and the signage typically consists of timetables printed on office paper, which melts when the rain gets inside and turns brown when in the sun too long. There are often no route maps, no system maps, and no regional maps. There were system maps at the San Rafael Transit Center and the Lucas Valley Bus Pad, but GGT had printed them so small I almost needed a magnifying glass to see where routes stopped. As well, there were no timetables for routes that didn’t come to that stop, forcing me to check on when the various exceptions to routing occur and leaving me in the dark as to whether I could switch to that service. Poor shelter. I boarded GGT at Polk & McAllister, which is the last primary stop for the service in San Francisco, but here is no shelter and no bench. Despite its prominent position in timetables and relatively high volume of traffic, GGT treats the stop like an afterthought. All they gave us was a pylon on the sidewalk with water-damaged route numbers and timetables. Poor lighting. I stopped by the Transit Center Saturday night and found the advertising far superior and better lit than the cheapo signage. Lack of next bus departures. Although I had brought with me a departure timetable, I had no way of getting this information otherwise, nor did I know if the bus had been early and I had missed it. Lack of next stop information. Despite long distances between stops and long headways, GGT chooses not to have its buses display which stop is next. Given that the technology that enables this is the same technology that enables next bus departure information, this should be a top technology priority for the system. Slow boarding and exiting. The back doors of some GGT buses are almost vestigial, as they are not for boarding – despite the presence of Clipper readers – and they have signs imploring customers not to exit via them. This means all boarding and exiting must occur at the front, forcing boarding passengers to wait for exiting ones to exit and forcing Clipper owners to wait while other passengers fumble for proper change. Frustratingly, the buses that do allow rear exiting don’t have Clipper readers, so Clipper users still need to exit the front to tag out. An old regional transit diagram from MTC, conspicuously absent from GGT’s stops. Why is it like this? GGT sells a valuable commodity – mobility – but it treats its customers like a burden. The cheap and ugly signage screams to customers that the service is similarly cheap and ugly. The lack of shelter tells customers they aren’t wanted. The poor lighting says GGT doesn’t even care about what signage is there. The incredibly inefficient boarding and exiting tells me that they either prioritize the needs of the bus driver over those of the passenger or that they bought the wrong buses. Many bus stops have shelters, but some of the major ones don’t. There is money to buy shelters, but the distribution seems haphazard. The same goes for lighting – properly lighting one’s signs and shelters goes a long way to ensuring the experience is pleasant for the passengers. Real-time arrival (next bus) kiosks are inexplicably absent. Although GGT equipped its buses with GPS to enable accurate Clipper Card payments and with WiFi internet, two major parts of a next bus system, the back-end infrastructure to enable next bus information is not in place. GGT makes up for this by being highly punctual, which could, in theory, enable next bus displays to count down to the next scheduled departures instead. MTC uses just such a display using GGT information in its style guide examples, but the district ignores what MTC developed and I saw no next bus kiosks anywhere except MUNI and BART. The most advanced and useful piece of technology used is the booklet available on every bus, complete with route information and system maps. While better than nothing, the maps don’t include a regional transit map or even a list of other transit services, rendering them less useful than they might otherwise be. In addition, the schedules are inconsistent as to which stops are listed. For example, the Lucas Valley Road bus pad is listed in some routes (the 49) but not others (the 70, 71, 80, and 101), leading the inexperienced passenger to believe those other routes bypass the pad when that’s not the case. GGT should choose which stops appear in the schedules and list them consistently. This is made all the more frustrating because it doesn’t need to be this way. MTC has a signage design document (PDF) that includes the Transit Center in its examples, so something better already exists on the MTC servers. GGT need only spend a little money to have it installed, which would be part of the MTC Hub Signage project. Other information, such as route numbers and timetables, could at least be laminated to prevent destruction by water and sunshine; using translucent plastic tiles would be even better. Installing monitors to count down the next arrivals and departures would enable passengers to wait in peace rather than in trepidation. Allowing Clipper Card holders to enter through the back door would encourage adoption of the card, and allowing passengers to exit through the back to speed boarding and offloading. GGT isn’t trying. 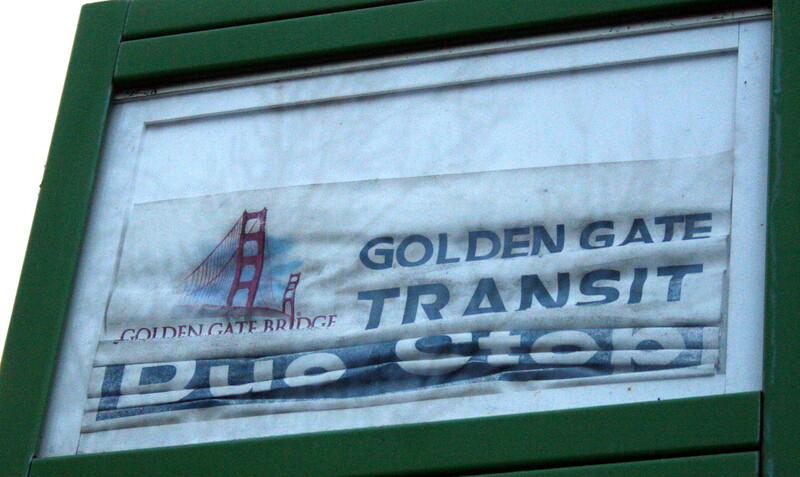 Although it is the only possibility for good access to Marin, although it is the only way for carless San Franciscans to find Marin and although it is the cheapest way for Marinites to move around the Bay Area, GGT seems to deliberately ignore or overlook simple solutions, many of which MTC has already developed. Indeed, some of the recommendations here were made five years ago by MTC itself (PDF). The return on investment could be huge, but for some reason the Board relies on cheap half-measures and ignores the effects on its image. Marin and Sonoma are incredibly wealthy counties, lands of the Cadillac, but their transit service sells itself as a Gremlin. The North Bay deserves better. A group of retailers are moving into abandoned storefronts in Old Downtown Oakland in an effort to revitalize the neighborhood in a concept called Popuphood. The idea of pop-up stores, where abandoned storefronts are temporarily occupied by retailers, is not new. They attract foot traffic to areas that don’t see many pedestrians and shoppers, giving a run-down neighborhood new buzz and new life. Applying it to a whole neighborhood, with multiple storefronts, is a much larger application. Check it out at 9th & Washington. If you’re going by transit, the nearest BART is 12th Street Oakland City Center, which you can get to via GGT to Richmond or San Francisco. Casual carpooling, wherein strangers carpool with one another to and from job centers, could be viable in the North Bay, but it will take coordination from citizens and government to make it really take off. When examining the modes of commuting, typically absent from the conversation is carpooling. Either it happens or it doesn’t, but governments and citizens will fixate on accommodating more traditional modes of transportation: single-occupant vehicles (SOVs, i.e., cars), buses, and trains, rather than actively trying to encourage carpooling. There are a number of reasons for this, but I suspect a big one is that there is no ribbon to cut, no new lane or train to inaugurate. Another big one is the perception that carpooling only rests on social networks outside the reach of government intervention, where coworkers discover by happenstance that they live near enough to one another that carpooling becomes an option. Besides, interfering in carpooling takes attention away from the big capital projects that make headlines. In spite of apathy from officialdom, the phenomenon of casual carpooling does arise in certain locales. Known in the Washington, DC, region as “slugging”, casual carpooling entails passengers forming lines at pickup areas, usually commuter lots or bus stops. A driver will approach the line, shout their destination (“Pentagon!” “Civic Center!”) and those bound for the area will hop in. It works both ways, and situating near bus stops gives passengers the option of a commuter bus if they’d prefer. Casual carpooling gives drivers and passengers certain advantages over SOV driving. It allows them to use HOV lanes, saving time, and it allows passengers to save on driving costs such as gas and maintenance. For those who aren’t in a carpool, carpooling means there’s more for them: every passenger is one less car on the road and one less parking space taken. It’s a win for everyone. So why does it pop up in some locations but not others? The Washington, DC, region makes an interesting test case. Straddling as it does three states (DC, Maryland, and Virginia), we can see how different policies effect the outcome. Virginia has an active and large slugging community dating back to the 1970s, while Maryland’s community is relatively small. The principal difference, according to David LeBlanc, author of Slugging: The Commuting Alternative For Washington DC, is that Maryland uses HOV-2 lanes, where having only one passenger qualifies, while Virginia uses HOV-3 lanes, where two passengers are necessary to use the lane. He argues that HOV-3 lanes give passengers a sense of safety when getting into a car with a stranger, and spurs drivers to more actively pursuit warm bodies to fill their vehicles. Dampers on casual carpooling include high-occupancy toll, or HOT, lanes, as Virginia will soon discover when its primary HOV corridor into DC is partially converted to HOT. If a driver can simply pay a toll to qualify, they will be less likely to detour to a slug line for passengers and clog the lanes with SOVs. The lack of HOV lanes, of course, will remove the incentive for the driver to pick up passengers as well. In other words, the North Bay, with its HOV-2 lanes that stop after Sausalito, is not ideally suited to casual carpooling. While Northern Virginia has an entire reversible highway dedicated to HOV-3 that extend all the way from suburbs to job centers in Arlington and the District, complete with their own exits and with limited access, the North Bay has only a single HOV lane in either direction that requires drivers to slow from top speed to the speed of traffic in order to merge over to the exit, and which stops before reaching either the East Bay or San Francisco. Although it’s conceivable that a small, Maryland-style community could spring up in the North Bay with the right tools – an app, say, allowing potential carpoolers to mark off their home and destination – true casual carpooling will require a bit more intervention at the governmental level. As with everything, there are cheap and expensive solutions. On the cheap side, just switching our HOV lanes to HOV-3 would be a boon, giving drivers a greater incentive to pick people up. Following up the switch with congestion pricing on both bridges applicable only to SOVs would prove a high-profile shot in the arm for any casual carpooling system. Given the hubbub over the last attempt to institute congestion pricing on the Golden Gate Bridge, the press would be wonderful. Instituting a peak-only HOV lane on the southbound side of the bridge would be another major reward for carpoolers: no more waiting in line at the toll plaza. Instituting congestion pricing at the Sonoma/Marin border or just north of Marinwood* would stimulate casual carpooling among Sonomans coming to Marin – our largest in-commuting population – and would raise millions for transit projects between the two counties. On the expensive side, CalTrans might consider combining Highway 101’s two carpool lanes into a single, reversible HOV freeway, complete with limited access and dedicated on/off ramps. This would make carpooling significantly safer and faster, and would have the added bonus of improving bus access along the freeway. The cost, however, would likely be upwards of $1 billion given the technical challenges of HOV exits and the cost so far just to extend regular HOV lanes. It has been suggested that the app described above would help drive a casual carpooling renaissance, but the truth is that these networks typically form in response to everyday commute pressures – heavy traffic, centralized job centers – that ultimately come from structures either put in place by government or arising out of commuting physics. That’s not to say technology does not have a role to play – casual carpool networks often have websites to guide potential participants and there are a number of apps already in existence – but a truly robust system will be one that arises organically. Drivers will only take the time to pick up passengers when they can clearly see that it is worth their time or money to do so. Casual carpooling in Virginia has been described as another transit system by the Virginia Department of Transportation, complementary to the existing Metrorail and bus systems. It certainly has a place in the highway-centered transportation systems of the US, but it will take work to implement in the North Bay. *Most freeway traffic in Marin actually comes from Novato, not from Sonoma; although instituting congestion pricing there would be a political nonstarter, it would make the most sense from a practical standpoint. For information on casual carpooling in the Bay Area, RideNow.org has a website dedicated to the local network. For information on ridesharing in the Bay Area, you might want to look into eRideshare.com. For information on how the slugging system works in Virginia, local NPR affiliate WAMU aired an hour-long segment on the subject, while local transit blog Greater Greater Washington has a number of posts on the subject.